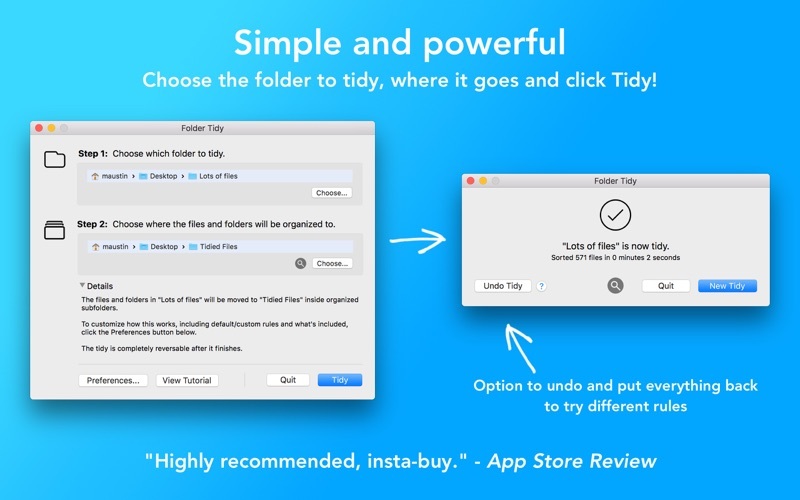 APP STORE FEATURED & MACWORLD GEM - End the chaos of messy folders. 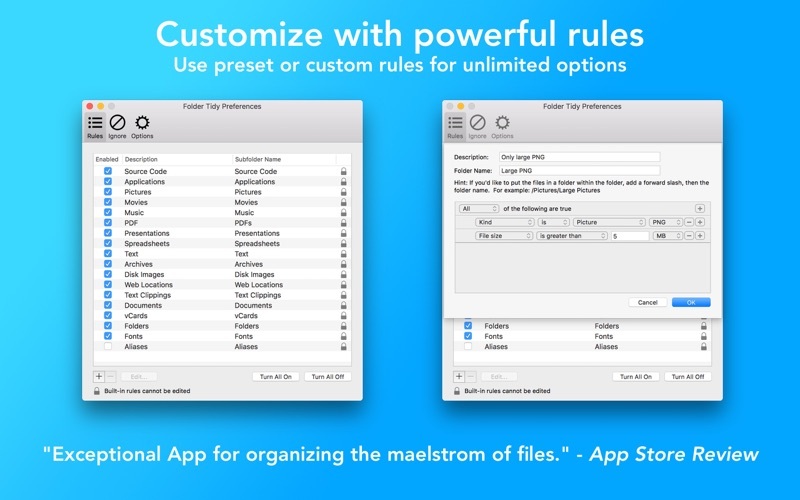 Organize any folder with tons of built-in rules or create powerful custom ones. 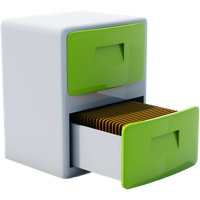 Folder Tidy uses all available CPUs for the fastest tidy possible and can handle GBs or even TBs of files. With one click Folder Tidy will sort the files from the messy folder into the appropriate sub folders (Pictures, Word Documents, Numbers, Archives, etc). Need a little more control? Open up the preferences, change the order of the built-in rules, or start to make custom rules. Use the powerful predicate editor to make pretty much any rule you'd like. For example, create a rule to move all photos with a size bigger than 5MB and older than a year into a folder. • Organize your files into subfolders based on the file type and/or rules. • Use one of the many built-in rules, or create powerful ones based on predicates. • Choose what types of files to clean up. 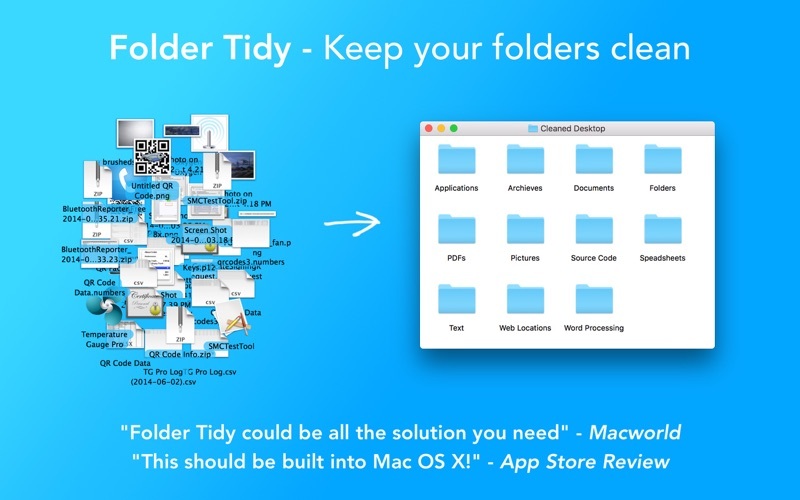 • Choose files and folders to ignore during a clean up. 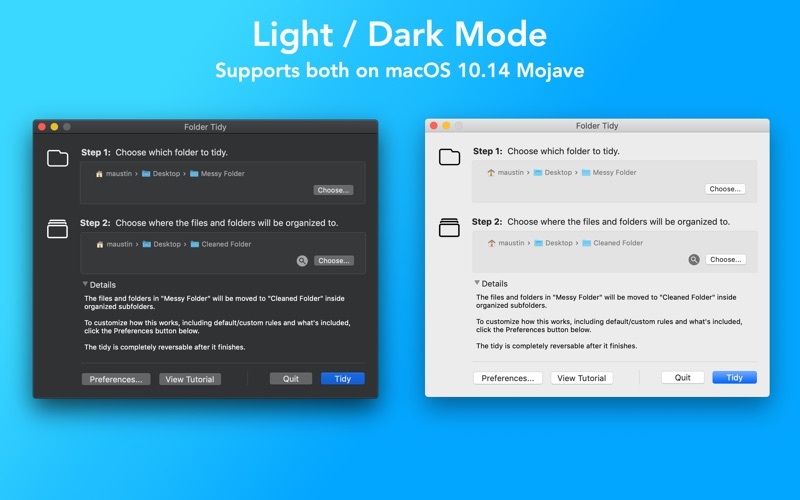 • Choose where to put the cleaned up files and folders. • Options to ignore aliases, folders and anything with a label. • Ability to undo the clean up. • Over 600 five star ratings internationally. 9/10 on Mac.AppStorm, featured on Lifehacker, Addictive Tips, Softpedia, Mac360, MakeUseOf.com & Macworld "Mac Gem".